Part of the regular diet I feed my leopard geckos consists of mealworms and dubia roaches; the benefits of these two insects being that they can’t climb smooth surfaces, so if my leos don’t eat any, I won’t have strays crawling around the vivariums. Therefore, one of the important things I look for in a feeding dish is that they are escape proof- tall and smooth enough that the critters can’t escape. I bought two Exo Terra dishes; one slightly shallower one (because I find my geckos are more interested if they can easily see wriggling insects) and a deeper one with two handy compartments. Let’s start with the shallower one. It looks great! Very natural with a lovely rock-like texture around the edge, but unfortunately, as soon as I put the mealworms in it, they were over the edge and crawling across the vivarium floor. I didn’t even attempt to put the roaches in as they’re much smarter and quicker. They would have escaped and hidden within seconds so I saved myself the trouble. Having said that, I really do like the look of this dish, and didn’t want to get rid of it, so I tried it out as a water dish for my baby leopard geckos, and it’s perfect! It’s shallow enough that it doesn’t pose a danger to baby or juvenile geckos, and my lazy leo seems to like treading across it instead of walking around it, so I’m hopeful this habit will keep his feet nice and moist around shedding time and prevent old skin from getting trapped around his toes. Now moving onto the dual-compartment dish – again it looks great with a natural rock-like texture, and also is much deeper so I was hopeful that it would prevent any escapees. When it arrived, it was smaller than I expected, but this isn’t a bad thing. It doesn’t take up a lot of space in my vivarium, and it means I can pile in quite a lot of mealworms on top of each other in the larger compartment. I find when there are more worms in a dish, the more there are, the more they move, and the more they move the more interesting they are to my geckos. Does anyone else find this? When I tried putting my dubia roaches in this, I had a little more trouble. When I only put the very small ones in the dish, it was fine, however after watching them for a while, some of the larger ones were able to piggyback on top of other ones and get over the edge, so sadly it didn’t pass the dubia roach test! In the smaller compartment, I have used this to keep my calcium powder in, and I’m very happy. 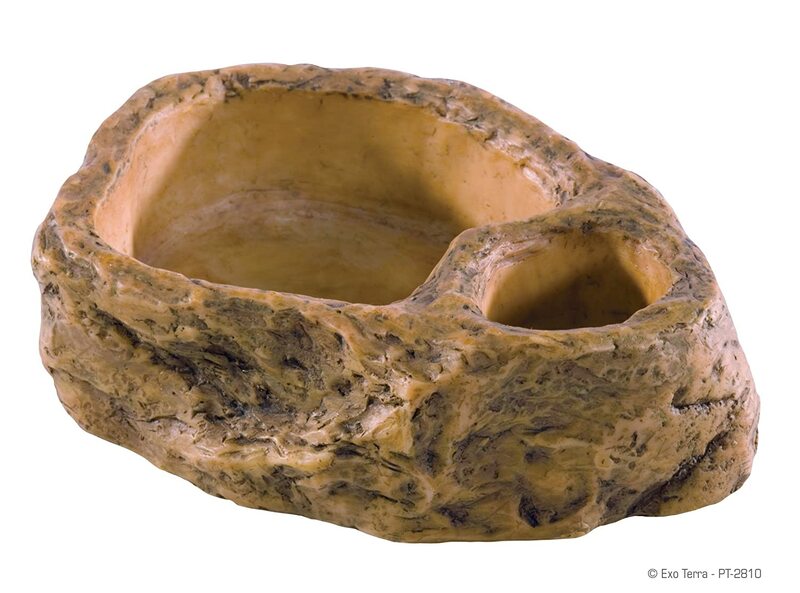 I’m sure the two compartments could also be used for food and water, or two types of reptile food, but I find that it great for keeping the calcium in, and it is very space-efficient in my vivarium. Previous Post: Which is the best substrate for leopard geckos?